New Updates to Our Social Network Software. mooSocial has a new update - 2.4.0! New version released with multiple bug fixes and improvements. We are listening! Use Feedback to suggest new features, report bugs, vote to get your suggestion or report heard. Have questions? Use Questions to get answers for your issues, concerns and to help out other members with theirs. 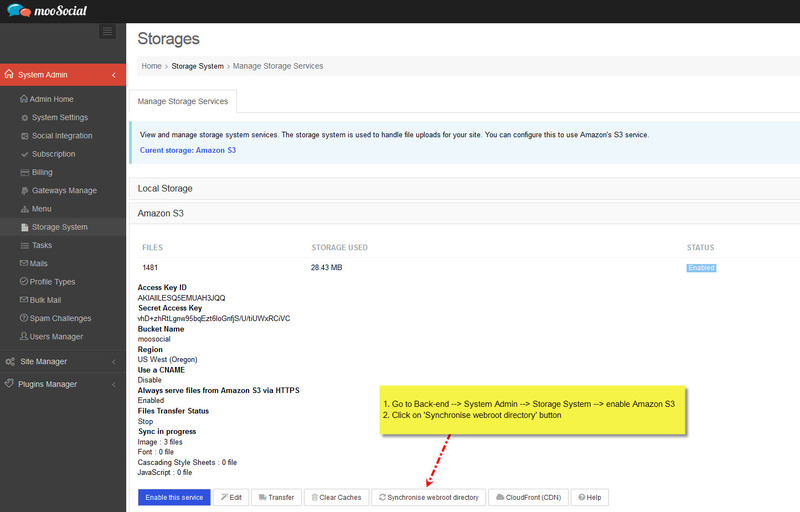 After installed a new plugin or making some changes in css, image, font and js and if remote Cloud Storage is Enable, please follow instructions in the below screenshot to configure remote Storage to make sure the latest changes are transfered to S3. 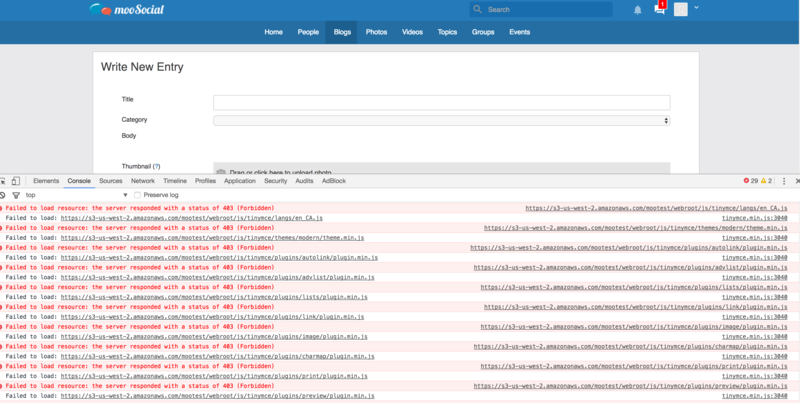 Normally, you will see the issue like the below screenshot if some files are on your server but not on S3 storage. 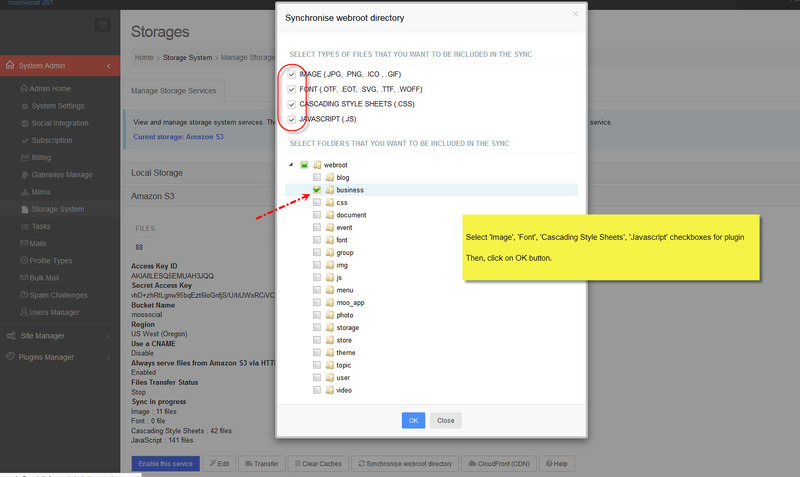 Admincp -> System admin -> Storage system -> Synchronise webroot directory. See below screenshot. Click on "Synchronise webroot directory", and you willl see below popup. Click OK to start Sync progress. You need to wait for a few minutes or may a few hours incase you have a lot of files that need to upload from selected folders to S3. The cronjob that you setup above will do this job so that you can close the web browser after clicking on "OK" button to sync. 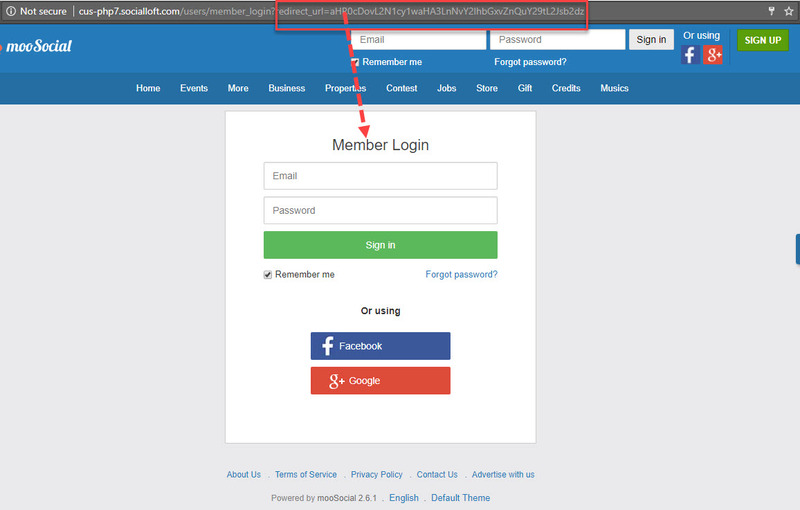 Then, visitors input the correct email and password on Login form, will be navigated to the selected site content before. Select language you would like to download from languages filter list, and enter your email and click Export button. After Export button clicked. Check your email to get download plugin language file link and click this link to download a po file. Use FTP or Cpanel to go to app\Plugin\youraddonname\Locale and create a your langauge folder (make sure your new langauge folder have the same name with your langauge folder on app/Locale ). Ex: you would like add vietnamese langauge for document addon, then you go to app\Plugin\youraddonname\Locale to create a "vni" folder. After your langauge folder created on app\Plugin\youraddonname\Locale please go to app\Plugin\youraddonname\Locale\yourlanguagefolder\ to create folder "LC_MESSAGES"
Clear browser cache and test again. Save and Follow Step 1 to Add language to your plugin. After renamed, go to yourlangaugefolder\LC_MESSAGES you can see yourplugin.po file , Use any editor program (like notepad, notepad++, poedit) to open this po file and translate this file to your langauge. After you translate to your langauge, copied yourlanguage folder into app\Plugin\youraddonname\Locale again.Clear browser cache and test again. Free free to contact us if you have any questions. 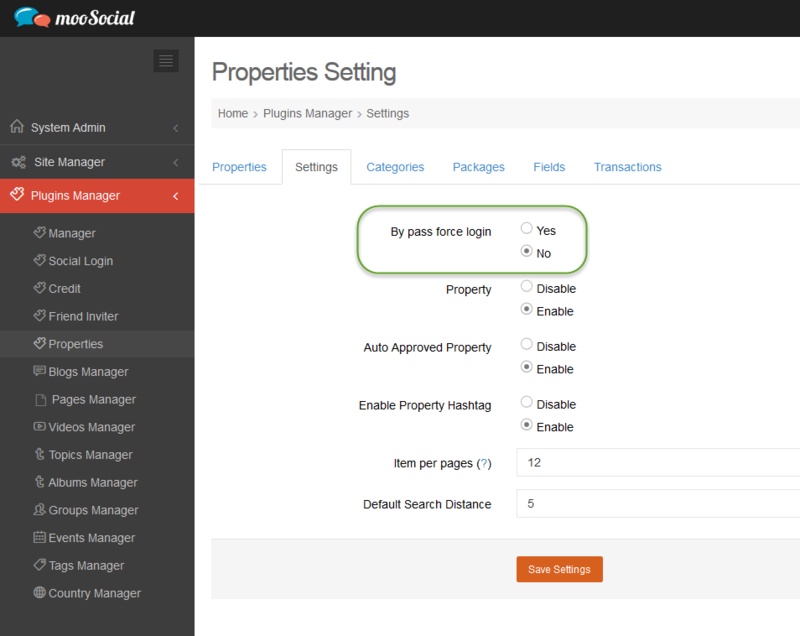 - If this option is no, the content of property plugin will not be visible to visitors. - If this option is yes, the content of property plugin will be displayed to visitors. * Note: This setting is affected when Force Login setting is enabled on Backend --> System Settings --> Features --> Force Login. 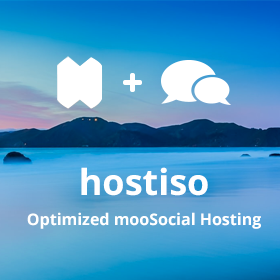 How to switch your mooSocial site from dev to production? - Create a new db on your hosting, export data from dev site and import it to new db on hosting server. To use Download a copy of data plugin please make sure you setup cronjob for your site. Requires wget command line utility: "wget -qO- 'https://community.moosocial.com/cron/task/run?key=3FSE@' &&> /dev/null"
Requires command line utility: "cd /var/www/html/moo-com/app/ & Console/cake cron run 3FSE@"
Step2: Go to your CPanel to setup cronjob for your site follow that guide. Failed: x times, last on mm/dd/yy at hh:mm then your cronjob setup success. But if you status is Succeeded: never or the last display for the long time then please go to step 1 to recheck. The first step to making money in your app with AdMob is setting it up. Published and unpublished apps can be added. If you set up an unpublished app, you'll need to come back to AdMob and link the app to its app store entry later when it's published. Complete the following steps to set up an app. Click Add app. A dialog box appears. Enter the name of the app and click Search. Click Add beside the app you want to add. Click Add ad unit to create an ad unit for this app or click I'll do it later to exit the page. 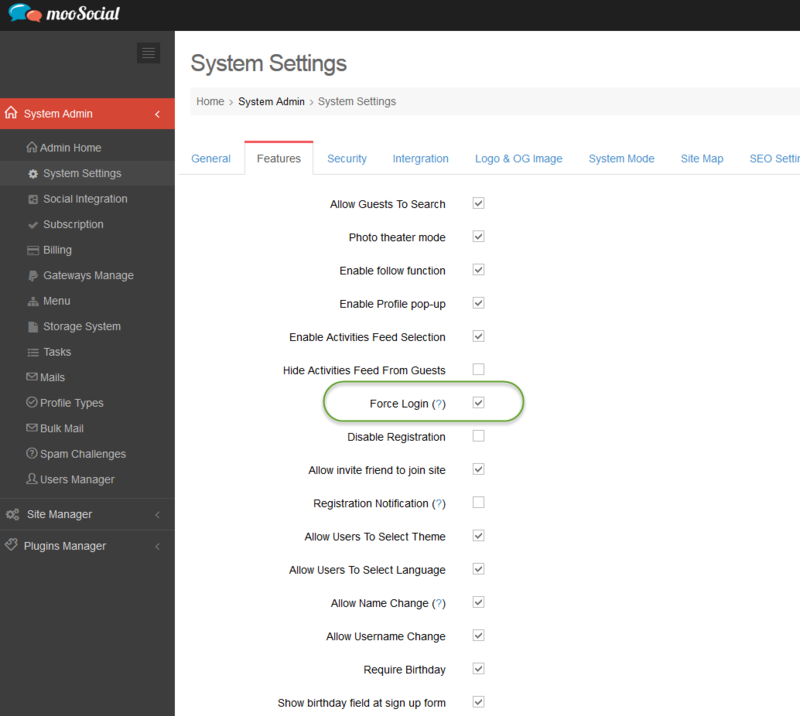 When it's published, you can return to AdMob and link your app to its app store entry.